Modern Crafter: "Squirrels are Nature's Party Animals"
"Squirrels are Nature's Party Animals"
The title is a quote from Quentin when I expressed that somehow squirrels seemed fitting for Valentine cookies. He said that squirrels fitted with every holiday. 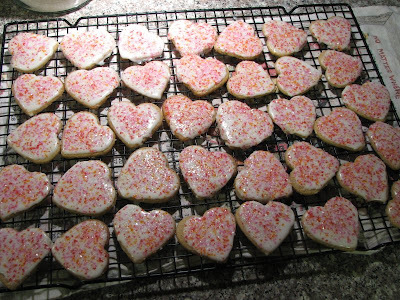 Cookies are going school tomorrow for the last day before Valentine's Day. (Thursday and Friday are Parent Teacher Conferences.) Q's work will just have to get them early because they're fresh. I love these cookies. 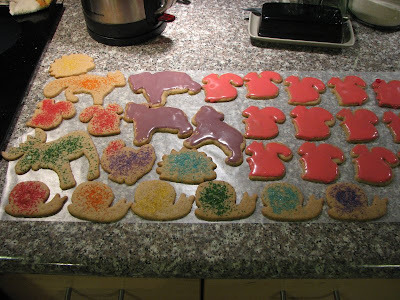 New cookie cutters that we picked up at Ikea just after Christmas - yay hedgehogs! 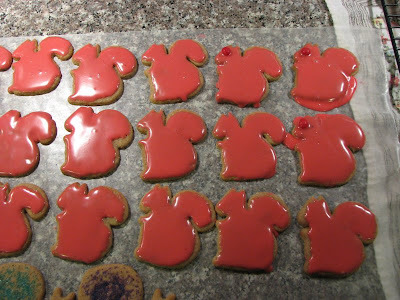 I also got to use my very favorite sugar cookie glaze recipe! The recipe for cookies at the link is really good too but tonight I tried the one from America's Test Kitchen. I made the rainbow snails. Q made the blue Sonic hedgehog, the "turkey vulture", and the psychedelic moose. We managed to get the elusive purple frosting this time too for the bear cubs. Scary demonic red-eyed squirrels are not getting taken to school but the regular pink ones are cute. I'm really happy with the Valentine sprinkle mix!